Well, DC comics has announced that All-Star Western will end with issue #34 in August. I was expecting this since there was a recent Justin and Jimmy interview where they mentioned that they had no plans on breaking Fleisher's Hex story count, but I thought they would have about another year before DC closed up shop on Jonah. But, Jonah is a tough bird to keep down, he will pop-up from time to time, heck it was only 19 years between Hex #18 and Jonah Hex V2 #1 (not counting the Vertigo stuff and you know I NEVER count the Vertigo stuff). Heck, it was ten years between All-Star Western #10 and Hex #18. We've had 8 years with Jonah Hex V2 and All Star Western V2 so I guess we really can't complain. I'll be savoring these last few issues, but I sure would have loved to have seen a Jose Lopez drawn Hex story in there somewhere. Stay behind the saddle-horn, and I'll see ya'll next week. I have some more stuff planned in my writings and musings, I have dug up some more old comics and I'm tempted to tear into the Vertigo stuff (figuratively and literally). Weird Western Tales #45 "Night of the Gun"
We have a new writer and a new direction for Scalphunter. Gerry Conway takes over the typewriter starting in this issue and we are plunked down square in St. Louis, Missouri in March, 1862. The Civil War has been raging for almost a year and Scalphunter strides boldly down the center of the street, people run from him and Union soldiers eye him carefully. Suddenly the night is broken by a man getting thrown out through the doors of Clancy's saloon. Two Union soldiers run out of the saloon, their intention is to finish what they started with Bat Lash. Scalphunter quickly draws a knife and expertly throws it into the chest of one soldier while Lash swiftly gathers his wits and pumps four slugs into the other soldier. A crowd gathers and Bat Lash makes his introduction and gives his thanks to Scalphunter. Savage states that he has taken no sides in this fight but other soldiers quickly appear and the two men race away down a nearby alley and into an open doorway. Lash realizes they are in a back storeroom of the saloon and he starts sampling some of the higher class wares of the establishment as he queries Scalphunter as to why a white man is wearing Kiowa warpaint. Savage ponders for a moment or two and then tells his story, of being kidnapped as a small child, raised by Kiowas and then finally being captured and returned home. Lash asks what Savage is doing in St Louis and the reply is that General Sterling Price was rumored to be hiding near Savages home and the Union soldiers came in and burned the town, killing several people in the process. Cathy Masefield, a local newspaper woman, had been digging into Savages birth records and found out that the Savage's had a daughter. After Brian was kidnapped, the Savages shipped their daughter, Samantha, off to St. Louis to be raised by her grandmother. The grandmother took out adoption papers and as Cathy is about to tell Savage some more about his sister, Union soldiers ride up and start shooting. Savage tried to carry Cathy to safety but she was struck by a bullet and he took her to Doc Grey. Scalphunter rushed back to his village but the soldiers had already been there and all but wiped out his people. Bat Lash sits quietly and recalls his own trek of vengeance after the death of his parents then tells Scalphunter that he will need some money to be able to locate his missing sister and offers a way to make that money, if Scalphunter doesn't mind bending the law. Savage states that he does not respect the law of the White-eyes so Lash takes his new partner to the office of one Cyrus Calhoun. Lash explains to Calhoun that Scalphunter is a white man that runs guns for a living and he would be more than able to help them handle that new Gatling Gun. The idea is that however owns the gun will be able to get rich off of it and be able to control the tide of the war. Gatling is shipping his prototype to Washington for the War Dept. and they plan to steal it. Lash and Scalphunter take off into the night, riding east and near dawn they come to a high train trestle. Lash explains that the train will be coming around noon and he plans to blow up the bridge. He hands Scalphunter several stick of dynamite and confesses his fear of heights. Scalphunter quickly and easily clambers up the trestle and plants the explosives when suddenly Lash hears someone behind him. Four men come riding up the canyon and are shooting at Lash. Bat returns fire and Scalphunter turns the battle in his favor by leaping from the bridge and stabbing two of the horsemen. Bat Lash takes advantage of the diversion and quickly shoots the two remaining horsemen. Just then ten more horsemen top a nearby ridge and the leader, Bear Barker states that Lash and Scalphunter have just killed his scouts. Bear also demands to know why Lash and Scalphunter were planting explosives. Barker figures that there is gold on that train but Bat explains that there is a treasure greater than gold and if they are allowed to live, he will split it with the thieves. Barker agrees and soon the whistle of the train is heard. Lash gives Scalphunter a rifle and asks if he can hit the dynamite from the edge of the ridge where they have taken up hiding. Savage takes aim, hits the dynamite and the entire bridge erupts, sending the locomotive and all the cars down into the gorge. At that point Bear Barker and Bat Lash are celebrating but Scalphunter merely scowls and mutters "I have done evil......" Barker wants to know what Scalphunter is referring do for doesn't he also hate the soldiers? Scalphunter explains that there is no honor is killing a man you cannot see. They all make their way to the bottom of the gorge to find a boxcar labeled "Property Federal Government" sitting upright. Scalphunter and Lash start prying open the boxcar door. As the door slides open, Bear starts getting anxious about putting his hands on the gold. The crated Gatling Gun survived the fall and the crate is bolted and chained to the floor. Lash and Scalphunter enter the boxcar and go around to the back of the crate and start opening it. Bear, thinking that he will be happy to soon kill Lash and Scalphunter, starts shouting that he wants the gold now. Lash grabs the handle of the gun and opens fire through the front of the crate, killing Bear and his men. Scalphunter stands silently by, looking at the carnage and then stares at Lash. There is a moment where both men try to read each other and Scalphunter picks up a large chunk of the busted crate. Lash asks what Sclphunter's plans are and he replies that there is no honor is killing men in this manner, soldiers should not be allowed to wipe out each other like bugs and he is going to destroy the gun. Scalphunter starts pounding away at the gun but Lash quickly knocks him out with the but of his pistol. When Scalphunter comes to he is alone in the boxcar, the Gatling gun and Bat Lash both gone. Gone, but now with a vengeful Indian warrior after them. Men Killed by Scalphunter - One soldier in St. Louis, two bushwackers in the gorge and an entire train of Union soldiers (50? 100?) and the train crew (Let's say 4). Being conservative that puts this issues total at 57! 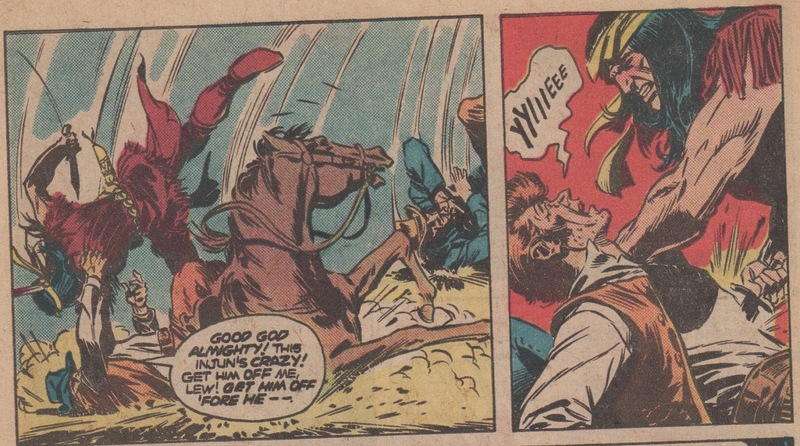 Compared to Jonah Hex- 83 vs 35 Scalphunter takes the lead in a big way. I have to admit I enjoyed Conway's run on Scalphunter a lot more than I did Fleisher's. Conway gave us a believable reason for Savage to move from the frontier and into 'civilization' even though it could be said that he lifted it from the TV series "The Quest" that ran two years prior. This was also a starting point in an acceptable ongoing continuity for Scalphunter, one that impressed me way back when I read it when the books hit the stands. One thing that bothered me about this story was that Scalphunter plants the dynamite, knowing that Lash planned on blowing the bridge and killing the soldiers and he even accepted the responsibility of firing the shot to set off the explosives. Why, once it happened, did he suddenly have all of this remorse? Did he not know what he was doing? That was the one glaring moment that Scalphunter was acting totally out of character. Also, didn't he realize what the Gatling Gun would do? It's almost like he was in a daze through those parts of the story. I did like that Cathy Masefield was removed from the series, I didn't think she really added much to the book. 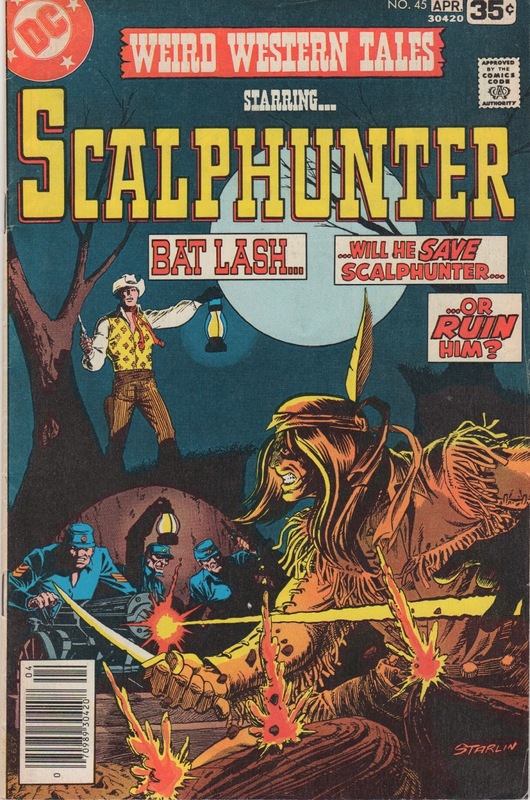 Next Issue: Scalphunter gets even and Bat Lash gets lucky.